Home / Astronomy / NASA / Physics / Science / 'Cold Spot' Anomaly Billions of Light Years Across --"Caused By a Collision With Another Universe"
'Cold Spot' Anomaly Billions of Light Years Across --"Caused By a Collision With Another Universe"
"This means we can't entirely rule out that the Spot is caused by an unlikely fluctuation explained by the standard model. But if that isn't the answer, then there are more exotic explanations. Perhaps the most exciting of these is that the Cold Spot was caused by a collision between our universe and another bubble universe. If further, more detailed, analysis of CMB data proves this to be the case then the Cold Spot might be taken as the first evidence for the multiverse - and billions of other universes may exist like our own." A supervoid is unlikely to explain a 'Cold Spot' in the cosmic microwave background, according to the results of a new survey, leaving room for exotic explanations like a collision between universes. The researchers, led by postgraduate student Ruari Mackenzie and Professor Tom Shanks in Durham University's Centre for Extragalactic Astronomy, publish their results in Monthly Notices of the Royal Astronomical Society. The map below of the cosmic microwave background (CMB) sky produced by the Planck satellite. Red represents slightly warmer regions, and blue slightly cooler regions. The Cold Spot is shown in the inset, with coordinates on the x- and y-axes, and the temperature difference in millionths of a degree in the scale at the bottom. The cosmic microwave background (CMB), a relic of the Big Bang, covers the whole sky. At a temperature of 2.73 degrees above absolute zero (or -270.43 degrees Celsius), the CMB has some anomalies, including the Cold Spot. This feature, about 0.00015 degrees colder than its surroundings, was previously claimed to be caused by a huge void, billions of light years across, containing relatively few galaxies. The accelerating expansion of the universe causes voids to leave subtle redshifts on light as it passes through via the integrated Sachs-Wolfe effect. In the case of the CMB this is observed as cold imprints. 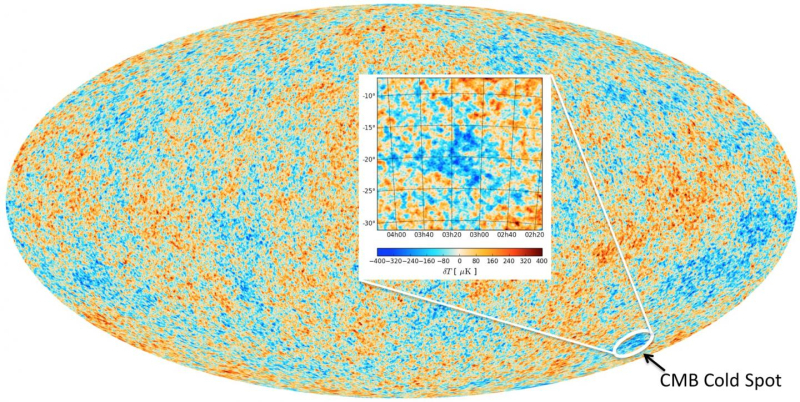 It was proposed that a very large foreground void could, in part, imprint the CMB Cold Spot which has been a source of tension in models of standard cosmology. Previously, most searches for a supervoid connected with the Cold Spot have estimated distances to galaxies using their colours. With the expansion of the universe more distant galaxies have their light shifted to longer wavelengths, an effect known as a cosmological redshift. The more distant the galaxy is, the higher its observed redshift. By measuring the colours of galaxies, their redshifts, and thus their distances, can be estimated. These measurements though have a high degree of uncertainty. In their new work, the Durham team presented the results of a comprehensive survey of the redshifts of 7,000 galaxies, harvested 300 at a time using a spectrograph deployed on the Anglo-Australian Telescope. From this higher fidelity dataset, Mackenzie and Shanks see no evidence of a supervoid capable of explaining the Cold Spot within the standard theory. The researchers instead found that the Cold Spot region, before now thought to be underpopulated with galaxies, is split into smaller voids, surrounded by clusters of galaxies. This 'soap bubble' structure is much like the rest of the universe, illustrated in Figure 2 by the visual similarity between the galaxy distributions in the Cold Spot area and a control field elsewhere. Mackenzie commented: "The voids we have detected cannot explain the Cold Spot under standard cosmology. There is the possibility that some non-standard model could be proposed to link the two in the future but our data place powerful constraints on any attempt to do that." If there really is no supervoid that can explain the Cold Spot, simulations of the standard model of the universe give odds of 1 in 50 that the Cold Spot arose by chance. For the moment, all that can be said is that the lack of a supervoid to explain the Cold Spot has tilted the balance towards these more unusual explanations, ideas that will need to be further tested by more detailed observations of the CMB.